The German government and multinational companies have taken note of Premier Doug Ford’s decision to pull the plug on wpd AG’s White Pines wind project in Prince Edward County, as well as the bill now before the legislature that will allow the province to set limits on what compensation is provided, Ms. Sparwasser said in a telephone interview. “Obviously, every incoming government has the right to change policy direction,” she said. “But to have a unilateral cancellation pushed through by law that way is unsettling for the company, but is also something that will unsettle other potential investors." 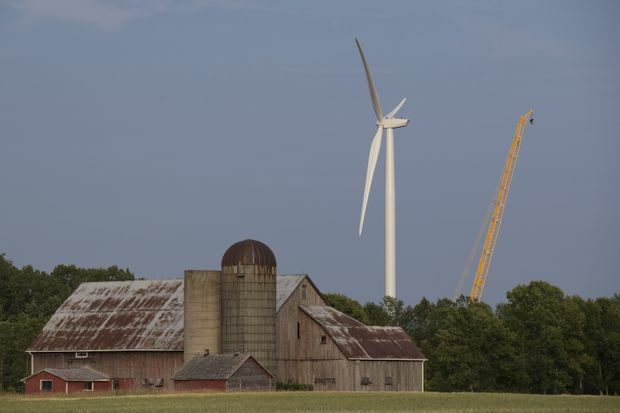 Wind turbines at the White Pine Wind project tower over a nearby farm in Milford, Ont., on Thursday, July 12, 2018. The Progressive Conservative government announced the cancellation of the 18.5-megawatt White Pines project two weeks ago and introduced legislation last week to allow the termination and to limit the compensation the province would face. Wpd Canada Corp. had been developing the project over the past 10 years, and received final approval for construction from the province’s Independent Electricity System Operator (IESO) in May, just after the election campaign began. That cancellation was separate from the government’s decision to terminate 758 renewable energy projects which had IESO contracts that had not been finalized. The ambassador’s warning was echoed by John Manley, president of the Business Council of Canada, which represents chief executive officers of the country’s largest firms. In a letter to Premier Ford dated Monday, Mr. Manley urged the provincial government to reconsider the cancellation, saying it is sending the wrong signal as the premier declares the province “open for business.” He compared the decision to the move by the New Democratic Party government in British Columbia to throw up barriers to the federally-approved Trans Mountain pipeline expansion project, which would increase oil exports from the West Coast. The White Pines project was well into construction when PC House Leader Todd Smith — who represents the Prince Edward County riding — announced two weeks ago the locally unpopular development was being killed. The government argues the IESO should not have issued a construction permit during an election period when major government decisions are typically put on hold. The company has indicated that it will seek to recoup $100-million that it has sunk into the project, but it is not clear how much the provincial government will agree to pay. The legislation requires wpd to cover the cost of decommissioning the project and to restore the land to “clean and safe condition.” The law — which was being debated on Monday — also bars the company from suing the government. Despite the government’s announcement earlier this month, wpd has continued construction and now has four of its nine turbines erected. Wpd Canada president Ian MacRae said that until the provincial law is passed, the company remains under contract with the IESO to complete the project. “We have a valid contract and an obligation to execute on that,” he said on Monday. However, Queen’s University law professor Bruce Pardy said the Ford government is well within its rights to cancel a contract that was entered into by a previous regime. In a paper written in April, Mr. Pardy said a new government could terminate or amend all renewable power contracts through legislation and limit compensation to be paid unless the owner was a foreign company that was covered under the North American free-trade agreement or other trade deal giving investors recourse to dispute-settlement arbitration. For wpd, the Canada-European Union trade agreement does not provide redress because, while most of the deal’s provisions are in force, the chapter covering investors' rights requires ratification from all 28 EU members, which has not yet been done. Mr. Pardy played down concerns that the White Pines termination would hurt Ontario’s reputation as a place to do business.